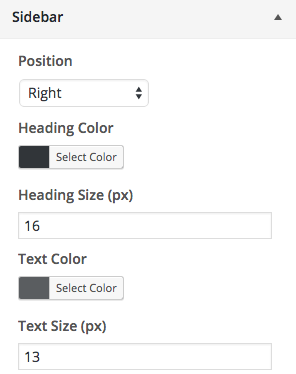 The Sidebar section allows position and design changes to be made to the widget sidebar area. By default, the sidebar is positioned on the right of posts and pages using the Default page template. Use this setting to change it to the left. If you’d like to remove the sidebar, delete all the widgets in the area and the sidebar will be removed. If you’d like to control which widgets are displayed on each post/page/area of your site, give Jetpack Widget Visibility a try. The color of sidebar widget titles. Defaults to #313539. The font size of sidebar widget titles in pixels. Default to 16. The sidebar text color. Defaults to #5a5d60. The sidebar text size in pixels. Defaults to 13.